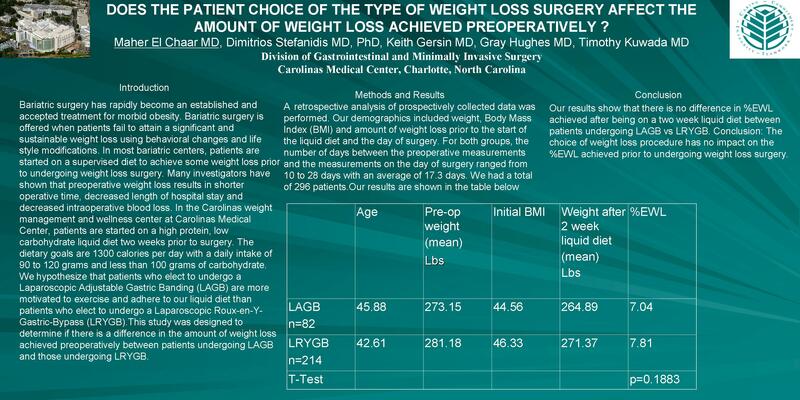 Does the Patient Choice of the Type Weight Loss Surgery Affect the Amount of Weight Loss Achieved Preoperatively ? Our results show that there is no difference in %EWL achieved after being on a two week liquid diet between patients undergoing LAGB vs LRYGB. Conclusion: The choice of weight loss procedure has no impact on the %EWL achieved prior to undergoing weight loss surgery.